The author making her way down from Galtaji in Jaipur. All photos courtesy of Carol Miltimore. 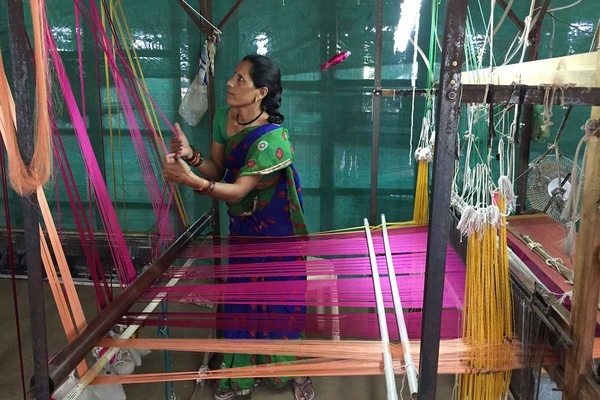 Inspired by a lifelong passion and respect for artisan handiwork, designer Carol Miltimore connected with skilled craftswomen and men in India for her fashion line Seek Collective. 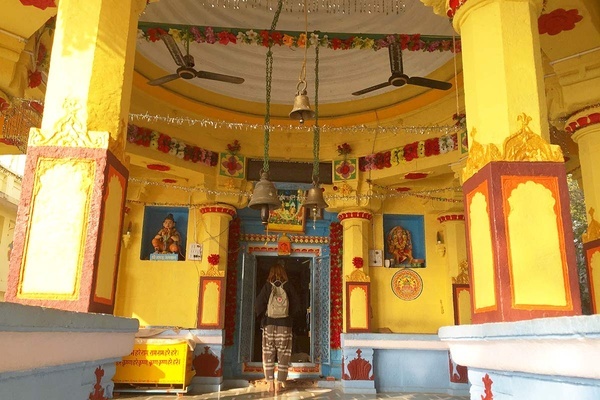 On her most recent visit, Militimore made her way through Jaipur, north Goa, and Maheshwar. So, what brought you to India? Initially: For an adventure. Now: My work for Seek Collective brings me back each year. What was the best tip you got before your first visit to India? A few different people warned me that I should be prepared to feel overwhelmed. Some said it would be the poverty, others the amount of people and traffic, and still others said it would be all the sensations combined. India certainly has all those things, but there are also beautiful and peaceful places where you're surrounded by nature, which is not something most know or tell you about if they've only gone as a tourist to well-known urban areas. My favorite airline to fly is Emirates, which takes me through Dubai for a short layover, and from there into Delhi or Mumbai. I don't have work in either city, so I usually arrange a domestic Indian flight for soon after I land. After 24 hours of travel and three flights, I'm always ready to stop moving. Everyone who flies to India regularly has obsessive preferences about which airline to fly and what route to take. I also like Virgin Atlantic so that I can have a free layover in London and visit with friends. The magnificent — and pink! 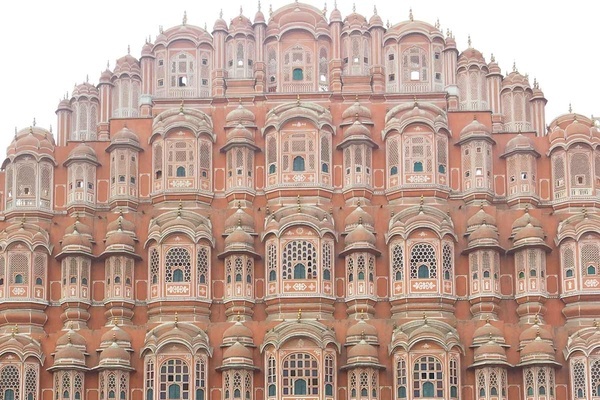 — Hawa Mahal in Jaipur. Navigating the winding streets of a Jaipur market. My most recent trip was rather quick with a lot to fit in. The first three nights were spent in north Goa, which is a little over an hour from the natural dyers I work with. Boutique hotel Elsewhere is a haven on Mandrem Beach. The dyers I work with are on the border of Goa in a remote inland jungle and farmland area. It's incredibly peaceful and beautiful, but if I have a day off I like to head to the beach. From there, I flew into Indore City and drove over two hours to get to Maheshwar to meet with a cooperative of women weavers. While there, I stay at Ahilya Fort, which is one of the most special hotels I've ever been to, in a historical fort overlooking the holy Narmada River. After my time in Maheshwar, I drove back to Indore City and took two flights to get to Jaipur. In the past I've taken an overnight train between Indore and Jaipur — which I prefer — but it only runs one or two nights per week. I stayed at 28 Kothi, a boutique guesthouse in a nice residential part of Jaipur that feels like the home of a friend with amazing taste. 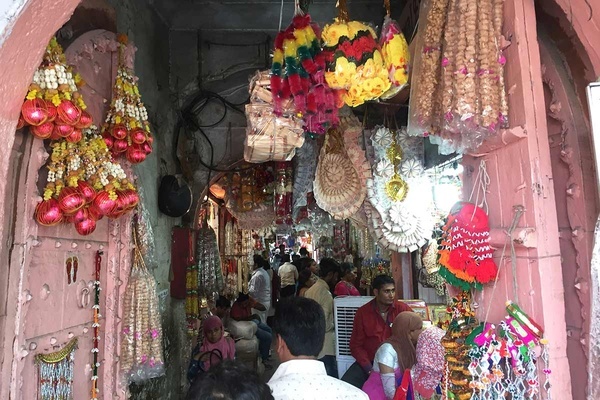 While in the Pink City, I worked with my factory and found time to shop and take in the scenes of the local bazaars in the old city. I had a friend in tow, who was visiting India for the first time, so we went to touristy sites like Amber Fort, City Palace (Jaleb Chowk, near Jantar Mantar), Hawa Mahal (Hawa Mahal Rd. ), and the Jantar Mantar. When it's time to work with the block printers, who are located outside the city, or when I need space to work or think, I always stay at Savista Retreat. It's a beautiful boutique hotel in a restored family property in the countryside of Jaipur, perfect for tranquility. What did you know by the last day that you wish you had known on the first? I needed more time in each place, always. When I travel in India, I always meet new and interesting people, which is one the best parts of traveling in general. On my last trip, during lunch on New Year's Eve in Goa, my friend and I met two wonderful couples from London who invited us to have dinner with them at Fort Tiracol up on a hill overlooking the Arabian Sea. It was completely spontaneous, a lot of fun, and very special. Flight delays on domestic Indian airlines. They always have flight delays in January, citing foggy weather in the north. It still doesn't make sense to me after all these years because planes have radars. Pouring a glass of chai at Tapri in Jaipur. A colorful temple on the banks of Narmada River in Maheshwar. In Jaipur, I think the Jantar Mantar (Gangori Bazaar) monument and the old city bazaar are my two favorite tourist sites. Ahilya Fort is luckily off the tourist radar — the sunset boat ride there is not to be missed. Delicious fish curry and Kingfisher beer in Goa. My two favorite places for this are Elsewhere in north Goa and a little hut in south Goa at Seastar Resort. People typically think of the beaches in Goa, but the old Portuguese architecture found inland is also worth exploring. In Maheshwar, one should spend time visiting with and learning about the handloom-weaving craft, which has an incredible history. I love walking along the river and visiting the different colorful temples. Jaipur is becoming more cosmopolitan every year and there are some fun bars and restaurants to check out, including Bar Palladio for a drink, Caffe Palladio for lunch, Peacock Rooftop Restaurant for a fun and cheap dinner with a view, and Peshawari for an indulgent meal. 1. Meal: Lunch under the banyan tree at Elsewhere in Goa. 2. Neighborhood to explore: Tripolia Bazar and Johari Bazaar in Jaipur. 3. Things you did: Befriending people at a painted temple early one morning in Maheshwar and taking in the sunset on the roof of Savista Retreat in Rajasthan. 4. Cafe: Tapri on the roof across from the central park in Jaipur for afternoon tea. 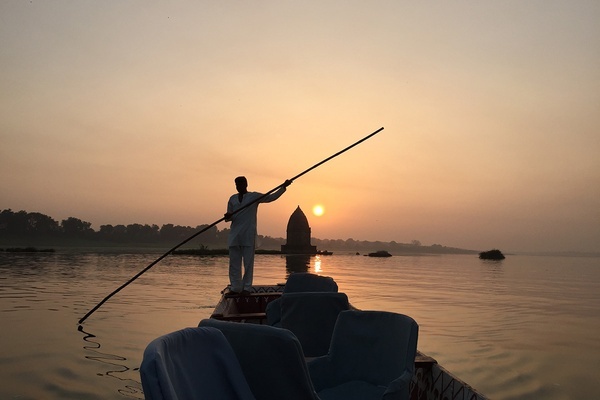 A sunset boat ride on Narmada River in Maheshwar. A handloom weaver for Seek Collective. Still on my list of things to do is visit Mandu, the ancient ruined city between Maheshwar and Indore City in Madya Pradesh. India surprises me every single day. It's a feast for the eyes with color and scenes that astonish even the most cynical person. Chai. It's basically the national drink and a daily tradition. When you visit people or have a work meeting, the first thing offered is chai. 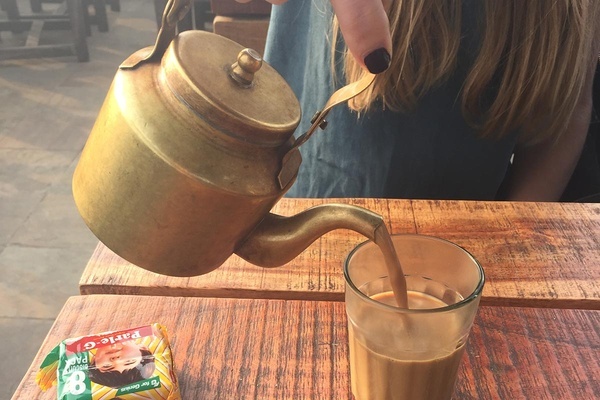 Also, the chai in India is incredibly delicious and sweet — nothing like the chai served at cafes in the West. When done right, the black tea is boiled heavily with rich whole milk, spices like ginger or cardamom, and sugar. The result is truly special. I make it at home a lot, but it's never as good as what they serve in India. 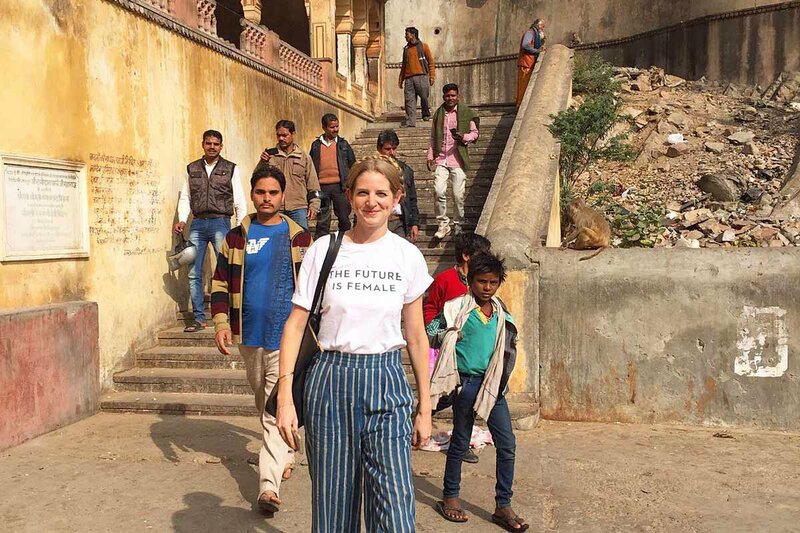 Walking down from Galtaji Temple, sometimes called the Monkey Temple, in Jaipur, wearing my "Future is Female" T-shirt. My friend snapped my picture without realizing a group of boys and men were walking down right behind me, all looking at the camera. It looks planned but it was a total accident. The only healthy relationship to have with India is a love/hate relationship. Be aware of the dangers and negative realities, but stay open to the beauty and magic of the people and place. Carol is the founder and CEO of Seek Collective. You can follow her on Instagram and Facebook. She travels for the growth that comes with expanding your horizons and perspectives and for the love of arts and crafts.